Matt co-founded the Dashing Whippets with Rich in May 2009. Matt grew up in Connecticut and graduated with a BA in Economics at Trinity College in Hartford, CT in 2000 and an MPA from the University of Connecticut in 2006. Matt has been running since joining his high school cross country team his sophomore year. He then had an admittedly mediocre cross country and track career at Trinity. 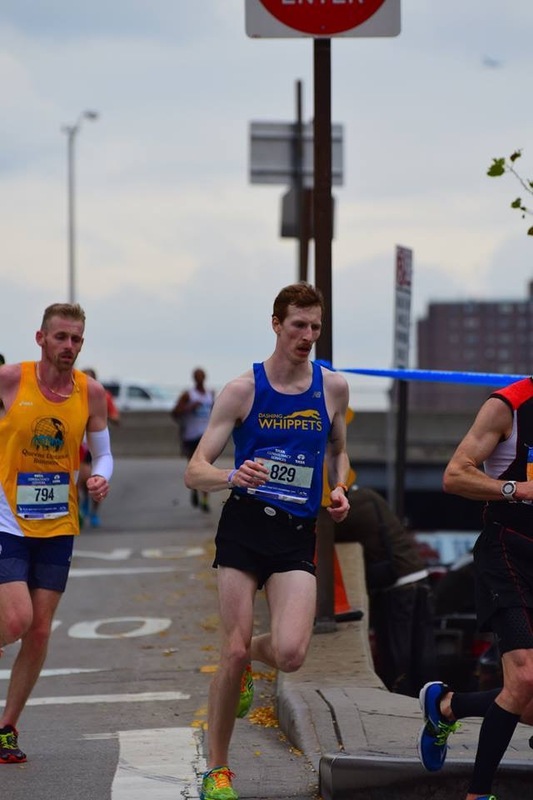 Since being with the team, Matt has completed 4 marathons, but mostly concentrates on shorter races, with PRs of 4:40 at the 2017 Fifth Avenue Mile, 17:15 5000 meters at a Thursday Night at the Races meet at the Armory, 22:56 at the Race to Deliver 4M, and 1:18:40 half marathon in the 2016 NYC Half Marathon. Matt lives in Clinton Hill, Brooklyn with his wife and twin daughters. Rich co-founded the Dashing Whippets back in May 2009. He currently works as Lead Software Engineer at Meetup.com. Rich grew up in Massachusetts and graduated with a B.Sc. in Computer Science from Brown University. Since being with the team, he’s completed 5 marathons (PR 3:15) and 4 triathlons. He now resides in Park Slope, Brooklyn where you can find him hosting runs in Prospect Park or hanging out at a local ramen or craft beer joint. A graduate of the University of Rochester and Brooklyn Law School, Blaise is a partner at the law firm Ropers Majeski Kohn & Bentley. Blaise concentrates his practice in professional liability and employment law. A member since August 2010, Blaise thinks about one day qualifying for the Boston Marathon (current PR is 3:25). 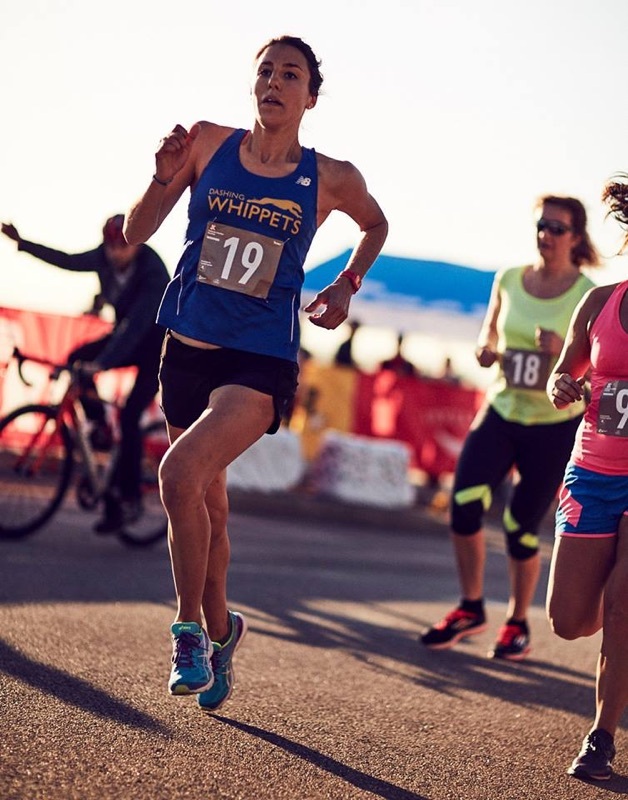 Brigette joined the Dashing Whippets in April 2015, hoping to meet training partners and to get back into competitive running. She ran cross country and track in high school, as well as for 1 year at the University of Pennsylvania, where she graduated with a BA in Neuroscience and minor in Mathematics. She attended FIT for a fashion design degree after her undergraduate studies, and currently works as a production manager at Carolina Herrera. Despite having raced up to the marathon distance, Brigette’s favorite race is still the 5k. She can be found at most Tuesday night team workouts in Central Park. Francesca joined the Whippets in 2012 while training for her first marathon. She has since ran 15 marathons, improving her personal best time to 2:49. 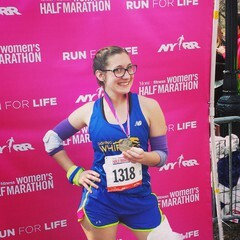 Although she did not run in school, Francesca feels like she can finally relate to student-athletes as she continues to train while pursuing her MBA at NYU’s Stern School of Business. Her favorite part about being on the team is going on destination runs for donuts or beer and runcations around the world with her teammates. Jonathan Park joined the Dashing Whippets in August 2014 so he could become faster than his dog, Monty. Now he’s too fast and has to leave Monty home during workouts. Jonathan attended Vassar College and Fordham Law School and is now a litigator. Jonathan lives in Park Slope, Brooklyn, with his wife, Alia, who will not let him hang his race medals on the wall. Jennie joined the Whippets in 2015. After captaining her high school cross country and track teams at Loomis Chaffee in Connecticut, Jennie took a break from competitive running while attending Washington University in St. Louis. Jennie now lives in Greenwich Village and is a teacher in the New York City public schools. Her PR’s include a 17:59 in the 5k and 37:49 in the 10k. Kevin Ghim joined the Dashing Whippets in October ’11. He as a BS in Biology from Gordon College and currently works at Mozilla as a Product Manager trying to figure out interesting things to do with data and personalization. Kevin has run two marathons with his PR of 4:23 coming from Harrisburg Marathon in 2012. He hopes to belong to the sub-4 club someday. Kevin chairs the team’s Social Committee. Michael Alcamo joined the Dashing Whippets Running Team in March 2013. He works in finance in New York City. Michael is a graduate of Princeton University and New York University School of Law. He chairs the Finance Committee and looks after the team’s partnerships. Terrence McGovern became a Dashing Whippet in January of 2013. He currently works as Head of Delivery Management at Kaplan Test Prep. Despite his title, he is not a doula; his team builds Kaplan’s online learning platform. Terrence grew up in Connecticut and graduated with a BA in English from Harvard University, where he ran cross country and track. His favorite distance is the 5k. He now resides in Park Slope, Brooklyn with his wife, daughter, son, and a “Bleacher Creatures” 14-inch doll of Jeremy Lin.